Ahh . . . after 3 weeks of unheard of calm coastal conditions on the Mendocino Coast, the wind has kicked up again. 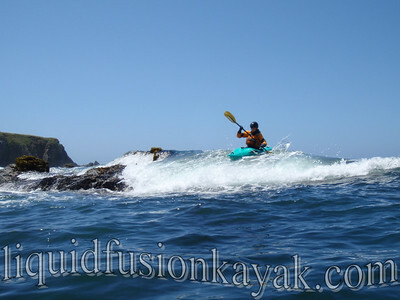 Just as it was starting to pick up on Wednesday, we enjoyed one of our favorite Mendocino sea kayak paddles from Russian Gulch to Smuggler's Gulch. Unfortunately, Smugglers' wasn't breaking for a surf session, but we did find a fun wave to play on just under one of the big archs of the Mendocino Headlands. Of course we ventured deep into the Mendocino Headlands via sea caves and played in rock garden currents and pour-overs. Randy was enjoying paddling his new poly Avocet. We kinda looked like twins with our lava colored Avocets and mango colored drysuits. Ralph let me take his skin on frame for a spin. Wow!!! Not only is it beautiful but light and responsive. I am super excited about our plans for kayak building this winter. Ralph took video footage from the day. It will be fun to see his footage. We had 3 sea lions negotiating swells outside of the Emerald City that we are hoping he got in his video. Today, I was at our local chapter meeting of Delta Kappa Gamma International, (an organization of women educators). This year I have been blessed with so many opportunities including a leadership role in our Iota Zeta chapter. When asked today to reflect upon my doings outside the realm of public education, a smile spread across my face and Mendocino Coast WILD LIFE came to mind . 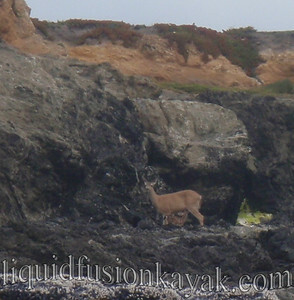 . .
A fawn nursing on the coastal rocks near Point Cabrillo Lighthouse. 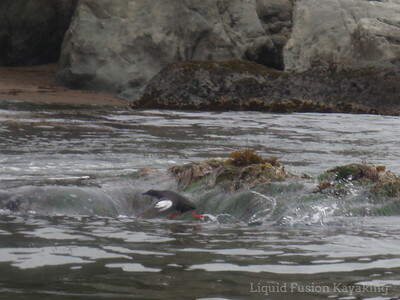 A pigeon guillemot escaping turbulent water. 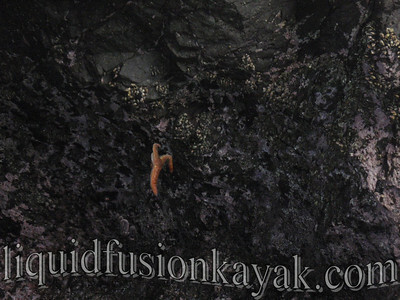 A starfish doing pull-ups in a sea cave. And me going a little wild - rock gardening in Fort Bragg's Noyo Bay.